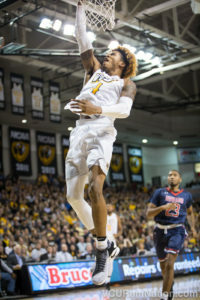 After beating Louisiana-Monroe on Thursday, the Rams were back at it on Broad street Tuesday night, this time hosting the Bison of Howard University. The first ever meeting between the two schools was never in doubt as VCU controlled the game from start to finish, winning 85-51. Senior JeQuan Lewis led all Rams in scoring with 17 on the night while junior Johnny Williams was right behind, chipping in 14 in the contest. VCU’s size was no match for Howard’s interior as 36 of VCU’s points came from within the paint. With that said, Senior Mo Alie-Cox only was able to drop in 2 points. The rebound match up was not as separated as the final score. The Bison grabbed 33 off the glass to VCU’s 35. The Rams would find 4 players scoring double figures at the end of the night. Freshman Malik Crowfield, Junior Justin Tillman, Lewis, Williams with 10, 12, 17 and 14 respectively. The win moves VCU to 10-3 on the season. The team will travel to Fairfax on Friday, December 30th to play the red hot George Mason Patriots.